Durable 50% recycled cotton/ 50% recycled postconsumer recycled polyester, regular-fit T-shirt that you can be proud to wear fishing, camping or downtown strolls. This super comfortable t-shirt is certified as bluesign approved and comes with Fair Trade Certified sewing. 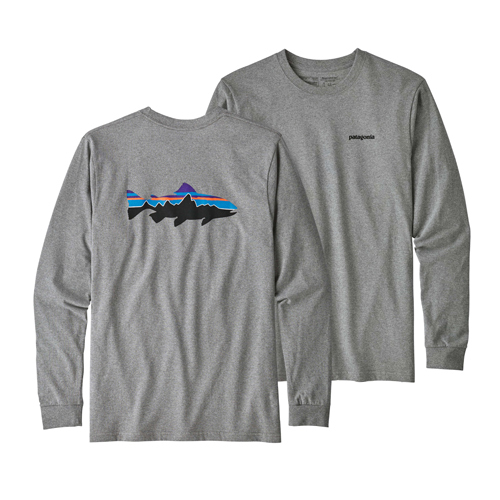 The classic Fitz Roy Trout is on the back of this long sleeved t-shirt while Patagonia is on the front left chest. on 9/2/2018 A great T-shirt. I like this design of this T-Shirt very much. The recycled materials is not very comfortable, but I like its environmental protection. I will recommend it to my friend.